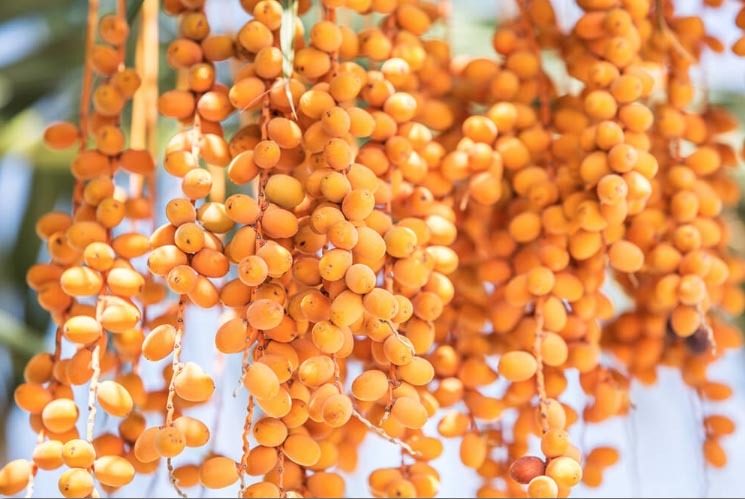 One of the more prominent palm species growing in Southern California for many decades, this is the classic tree of desert oases that produces sweet, delicious dates. Although they now can be found growing in many parts of the world, these palms originated in the Mediterranean region. The genus name Phoenix is a reference to the ancient Phoenicians who it is believed first domesticated wild date palm. A stately, clumping palm can reach 80 to 120 feet (24 to 36 meters) in height. New shoots sprout from the base of a dominant trunk. If left to their own nature, they form a lush clump of palms. However, in most maintained landscapes, the new shoots are carefully removed and potted for later transplanting. Feather-like fronds are beautiful, but an array of sharp thorns lie at the spot where each meets the trunk. As the fronds die and are shed, they leave behind diamond-shaped scars that mark the trunk. Small, yellow flowers hang in long sprays. Trees are either male or female, with the latter bearing the sought-after dates. Full sun and temperatures above 20 degrees Fahrenheit (-7 degrees Celsius) make for happy date palms. Once established, they prefer dry soil; too much water can harm them. Best results come from periodic light applications of special palm fertilizer. If harvesting the fruits is desired, it's important to have a spot that reaches 95 degrees Fahrenheit (35 degrees Celsius), or pollination will be affected. Once the fruits form, they need hot, dry temperatures or the dates will rot. Palms are one of the oldest known crops, cultivated in western Asia and northern Africa more than 5,000 years ago for their sugary fruit—and still commercially grown in Iraq, North Africa, and the United States today. 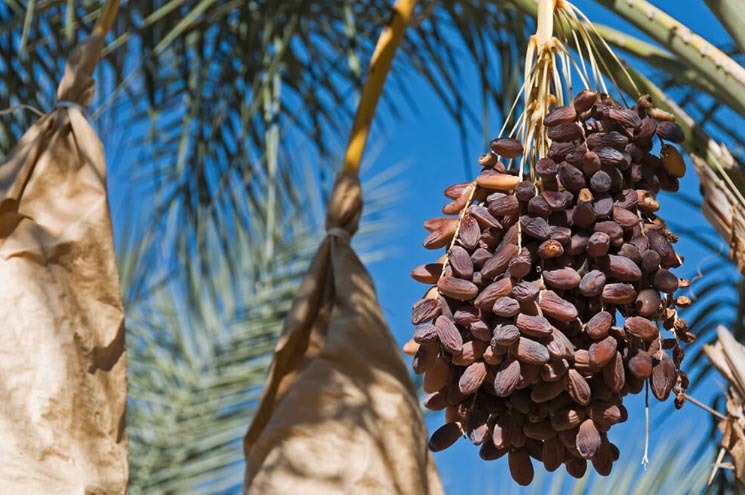 The date palm has long been considered the tree of life in desert cultures and is associated with fertility and fecundity. Perhaps that reputation, along with its association with paradise in many travel brochures and postcards is part of the reason it is now grown as an ornamental tree worldwide. The ancient Sumerians referred to this plant as the Tree of Knowledge of Good and Evil. 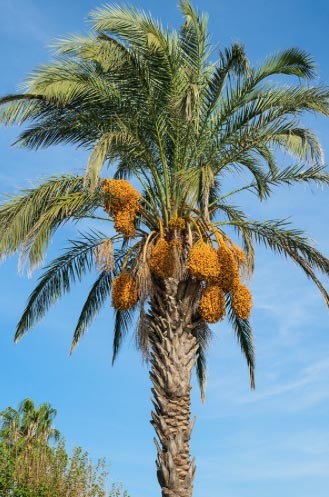 Many date palms were planted in Southern California during the Spanish Mission era in the late 18th century, when they provided food and thatch for early settlers. A veritable "forest" of date palms welcome you at the entrance to the Safari Park, and if you keep an eye out, you'll see many more throughout the grounds as well as around the Zoo.